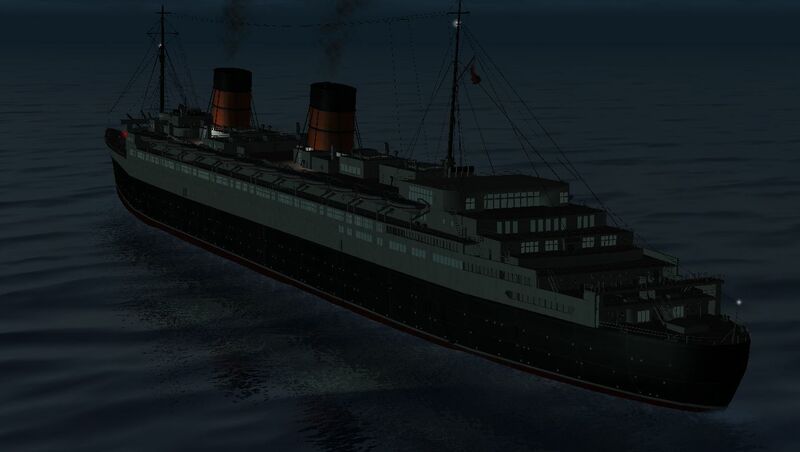 In those days i'm working on a new Queen Elizabeth model. I've finished 3d model for civilian version, i've imported all parts with 3ditor, created damage profile, and tested in SH3. I've found this strange bug: when a torpedo hit the hull, sometimes damage textures appears. Sometimes doesn't. Randomly. In both case ship slow down and take damage points \ sink. I've tryed to rebuild files, re-import models, clone files, no results. This is really frustranting. Is there anyone who can help me solve this situation? Last edited by VonDos; 08-21-2018 at 11:40 AM. after tons of test, i've found this interesting thing: whend torpedoes hit some unit parts, damage effects were just too small for be seen. What parameter is used ingame to regulate damage effect dimension? After just close and reload test mission, i try to shell again the ship. I'm asking myself if there's something wrong in my sh3 installation. Could someone please test this unit for me, and just hit her with shells and torpedoes? Last edited by VonDos; 08-23-2018 at 07:15 PM. Yes, i can test it. I have seen such behavior long ago on my own installation, but cant remember what the problem was. Also can not find related threads here on Subsim to lack on right Search-keywords. Can you identify this Damage-Texture? If this texture comes from a *.dat i would look first into this *.dat. Last edited by Hebe Vollmaus; 08-28-2018 at 12:30 PM. Last edited by Anvar1061; 08-29-2018 at 10:48 AM. This Damage-texture there looks like the one here. I think the Background is the original SH3 'Damage_metal_a.tga'. File names in Val file are OK, files are present. @Anvar1061 your linked post refere to a splitted half unit with wrong textures; sadly, this is a different scenario. I've read your linked post also, same problem, bingo, but where is the solution? In the past i was not able to identify this ugly big texture. I figured it must be came out of some different File, tga or dat, maybe by some sort of mismatching names in such dat. But thanks to VD's files now find out, this white zig-zack-pattern texture is actually the correct Damage-texture (Damage_metal_a.tga) but with many times concadenated to itself to each other and rotated by 45 degrees as intended. One small hole as Expl_mask01_a.tga in front and many copies of Damage_metal_a.tga as background but filles some great part or section of the ship-model. So it maybe have something todo with the 3D-model and its Texture-coordinates. I have never created a ship for SH3, so i'm not shure. I extracted the 3D-model with S3D, loaded into Anim8or, saved without touching the model, and reload into *.dat. Now these ugly white zig-zack-pattern is gone. But some Damage-textures are not shown or work as they should be. Here also, today also another test failure. are Queen Mary's damage decals similarly messy? Okay, are we 100% sure that the one in the video is your version of the Queen Mary? If so, is the Queen Elizabeth that you are currently working on a clone (separate dat, sim, zon, val. etc. files) or a proxy copy (shared dat file) of the former? So, except for the obvious removal of one of the funnels, which other modifications did you make to the unit? Did you mess with materials? Change 0 to 4 in the 3d "Model-info" of the Hull. Works much better then. And no need to scrap this beauty!